After you check out, we will send you an activation code and log-in instructions by email. You should receive the email within 20 minutes of check out. With the access code, you can select any one test of your choice for a duration of one year. 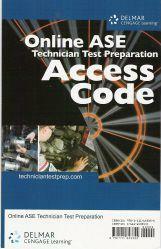 This code will provide access to the Online ASE Technicians Test Preparation (TTP) for the course of your choosing. TTP is the ideal way to gain the expertise required to pass the Automotive, Medium/Heavy Duty Truck, or Collision ASE exams. Within each task area, users can select one of three study modes: Practice Tests, Sample Tests, or Timed Tests. All Tests enable users to gain experience in answering ASE-style questions while simulating actual test-taking conditions and gauging their readiness for the exams. Feedback for each question provides helpful hints, in-depth explanations of both right and wrong answers, plus links to supplemental readings and/or animations/digitized video clips for each task area to ensure mastery. This product will allow a user to choose one of the following courses and will provide access to that course for one year. Your access code will be emailed to you within 20 minutes of checkout with instructions how to access the test of your choice.